From Painting to Tshirt: This painting is by Votan (NRSGNTS), an indigenous artist, and is a huge mural in downtown Duluth, MN. 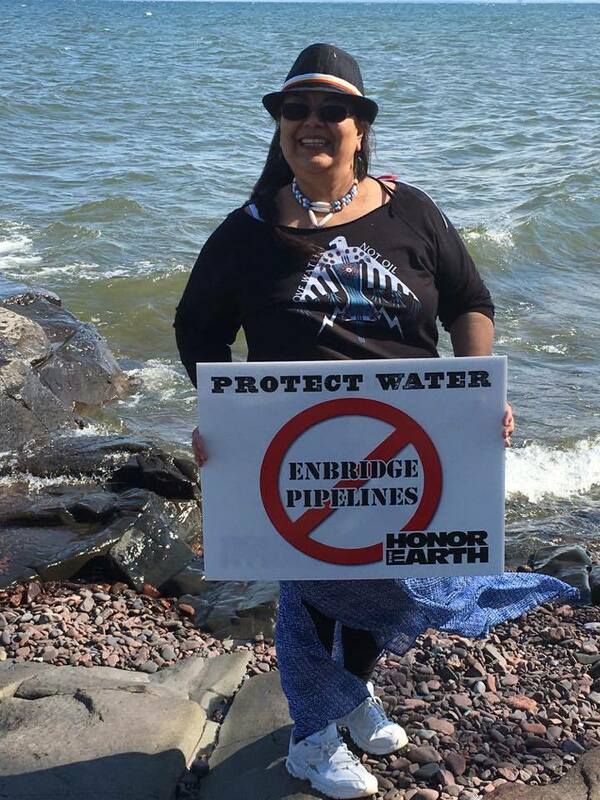 Our Water Protector is an Anishinaabe woman, who is looking over the greatest of the lakes--Gichi Gummi. She is facing with prayer and the power of the Natural world, the greed of the Wiindigo, the fossil fuel industry, mining and lumber barons. She is powerful. Currently SM, MED and LRG is sold out, BUT, we have reordered them so you can still order. We expect shipment before the holidays. Garments are 100% Cotton - Size chart unavailable but the women’s is fitted. LIMITED EDITION Honor the Earth NEW COLLECTION! Specially designed for our "Water Protectors." Beautifully embroidered patches. They are "iron on," backing to help with adding to your favorite garment, bag or laptop sleeve or whatever you choose. The size of the embroidered patches are 4x4 (size of a softball). Floral Water Protector patch is 5.5”x2.5” approximately and super cute on denim jeans, and shorts. Design by native artists INCLUDING Jackie Fawn, Anthony Sul, LittleRedfeatherDesing and more. Features Honor The Earth's beaded 4x4 embroidered patches. Our “Water is Sacred…” designed with love for our water by Christ Belcourt. We hope to move to protect our water and environment by not purchasing bottled water, and enjoying the clean water we strive to protect. Bottle is Stainless Steel that holds 25oz of beautiful medicine waters. Honor the Hemp: Market Tote - Rock the Lands! Official LOVE WATER NOT OIL design and also: featuring Jackie Fawn Illustrations, "Battle of the tar sands and pipelines from Kinder Morgan Trans Mountain, Energy East, KXL and Enbridge ... 4-warriors reemerge in a present day battle against the black snakes that emerge from the tar sands which is keeping our mother imprisoned as smoke billows from the mouth of the beast." Our goal is to reinvest to divest from fossil fuels, and walk the path of organic. Be part of the movement, and rock the lands in Hemp apparel. Design by LittleRedfeather Designand Ashley Fairbanks. LWNO Honor the Hemp baseball hat - Rock the Lands! Official LOVE WATER NOT OIL design. Our goal is to reinvest to divest from fossil fuels, and walk the path of organic. Be part of the movement, and rock the lands in Hemp apparel. Honoring our Women Water Protectors - Midnight blue color or Charcoal Grey. Honoring our Women Water Protectors beautifully printed onto Eco Jersey Vneck Tshirt in “Eco True Navy.” This is a 6-color process. Stunning Honoring our Women Water Protectors Hooded Pullover Sweatshirt. This is an exclusive garment. Will go fast. Allen Richardson . . .
Photo of Chief Allen Adam of Fort Chipewyan, Alberta - ground zero of the tar sands. A Warrior for the earth, lands and water. Bandanas designed with Thunderbird, and "Love Water, Not Oil" message. Honor logo in corner. We Love our Water, and Manoomin (Wild Rice)...not their dirty oil for Water is Life. Features Honor The Earth logo.